In recent years, resilience theory has come to occupy the core of our understanding and management of the adaptive capacity of people and places in complex social and environmental systems. Despite this, tourism scholars have been slow to adopt resilience concepts, at a time when the emergence of new frameworks and applications is pressing. 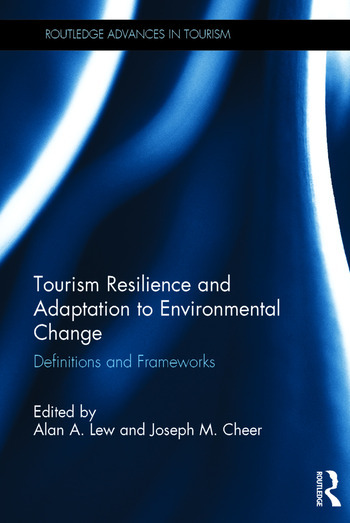 Drawing on original empirical and theoretical insights in resilience thinking, this book explores how tourism communities and economies respond to environmental changes, both fast (natural hazard disasters) and slow (incremental shifts). It explores how tourism places adapt, change, and sometimes transform (or not) in relation to their environmental context, with an awareness of intersection with societal dynamics and links to political, economic and social drivers of change. Contributions draw on empirical research conducted in a range of international settings, including indigenous communities, to explore the complexity and gradations of environmental change encounters and resilience planning responses in a range of tourism contexts. As the first book to specifically focus on environmental change from a resilience perspective, this timely and original work makes a critical contribution to tourism studies, tourism management and environmental geography, as well as environmental sciences and development studies. 16. Within the changing system of Arctic tourism, what should be made resilient to what, and for whom? Alan A. Lew is a professor in the Department of Geography, Planning, and Recreation at Northern Arizona University, USA where he teaches in geography, urban planning, and tourism. His research interests focus on tourism in the Asia-Pacific region, particularly in East and Southeast Asia. He is the founding editor-in-chief of the journal, Tourism Geographies, a Fellow of the International Academy for the Study of Tourism, and a member of the American Institute of Certified Planners.